We are contemporaries on this earth sharing a similar beginning, birth, and a similar ending, death. What is the purpose of our lives? What is our connection to each other? Some people may never find their answers because they don’t bother to ask questions. Those who understand that we are not a body having a soul, but rather a soul who is having a human experience receive answers quicker because they view our existence from a higher perspective. Prominently depicted in the background, the majestic pine tree exemplifies this significance and symbolizes creativity, protection, longevity and immortality. 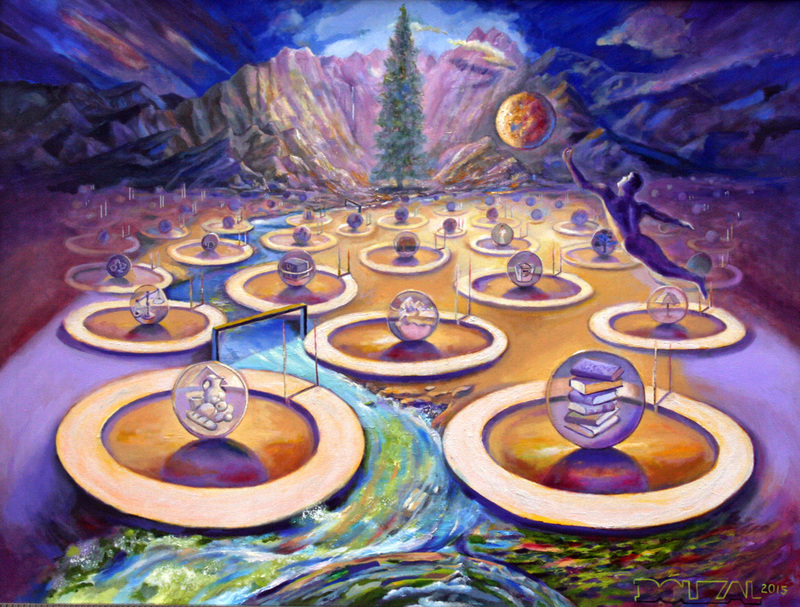 The painting displays an array of ellipses, each containing a symbol of a human interest: eating and drinking, learning, safeguarding, communing with nature, balancing karmic debts, procrastinating, wasting energy, etc. Based on our life record and individuality, we choose the tendency that is most appealing and follow the path counterclockwise until we decide to exit the gate and pursue our next preoccupation. Along the way, water flows through a pre-filter removing sediment of crumbling belief systems that glorify one person over another. The sweeping current then streams through the main filter, eliminating fragments of collapsing social mores that no longer support the well-being of mankind, creating a powerful eddy in its wake. The soaring figure realizes that we are all part of life around us and all are connected to the collective consciousness. The universal purpose of humanity is to rise above superficiality and ignorance and to evolve with each personal transformation. Like stepping stones, each generation learns from the misconceptions of the previous one and expands upon their accomplishments.